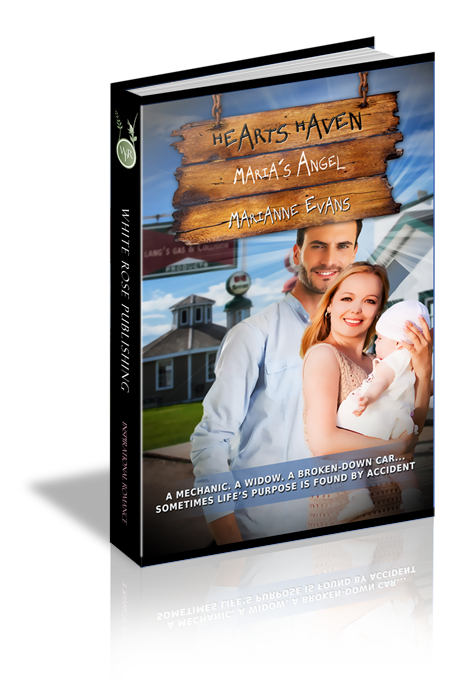 Trying desperately to find her way following a season of loss, Maria Wilde is literally at the end of her road, stranded in Angel Falls, Texas. She's on her way home for Thanksgiving in a car jam packed with her worldly possessions and the greatest treasure of all, her six-month-old daughter, Lilly. Brody Lang is a mechanic at the gas station where Maria finds herself temporarily sidelined. He's got the faith of an angel and willingly helps her out of a jam. Sensing God's intervention, Brody is compelled to help Maria find the road ahead. But can he work past the steel blockade widowhood has erected around Maria's heart? Can Brody and his friends at Heart's Haven convince her that re-claiming life and holding on to God's grace can lead Maria not just into new life, but a second chance at love as well? An ominous thump and flap stirred a shimmy that cut straight through the steering column of Maria Wilde’s old model minivan. She sucked in a breath and clutched the wheel tight when her tires bumped over something unexpected. A fast check of the rearview mirror revealed the mangled remains of a thick, black band of rubber. All at once, the steering wheel seized tight, making even the slightest navigational adjustments next to impossible to execute. She couldn’t steer. Angling her vehicle slowly out of traffic and onto the right shoulder of the road became the equivalent of single-handedly dragging a stubborn elephant because the vehicle didn’t want to cooperate whatsoever from a steering perspective. The process of stopping and throwing the car into park took a wrecking ball to the already weak walls of her composure. Maria crumbled against the steering wheel, resting her head against her tightly clenched hands. Tears stung, and her breath hitched. God—really—how much more can I possibly take? Please…please give me the strength to survive this. The cobalt bowl of a sky above her didn’t part. The huge, puffy white clouds that stretched and moved didn’t dissolve to reveal the instantaneous miracle for which she physically ached. Nope. Life was a lot tougher than that; a lot more complicated. What she needed to do, what she had to do, was find the way to keep marching on. Maria steeled her spine and blinked tears into remission. What was the use of crying? Crying wouldn’t solve the problems she faced nor would it help her move forward. Through the somewhat grimy windshield, she surveyed her surroundings. A flat, ambling stretch of brick buildings, canopied awnings, and quaint shops dotted each side of the two-lane road. Occasional passersby wandered in and out of view, wrapped up in conversations, or strolling with kids. Where was she, anyway? Mere hours ago she had left Dallas, headed due south. She had passed through Lufkin a few minutes ago. Shortly after that, she recalled passing a wooden sign laden by civic insignia that welcomed her to Angel Falls, Texas. Evidently she had hit the mechanical crisis point at the start of the town’s peaceful little main street. Great. Where was she going to find help in the middle of nowhere? Additionally, if she didn’t find a gas station soon—the blasted low fuel light had been on for at least twenty miles—she was going to be planted here for a good long while regardless of mechanical issues. She had ignored the indicator for as long as possible, hoping to coast to her destination on fumes if possible. A glance into the rearview mirror stilled Maria’s spirit at once and reinforced the steel of her determination. In the rear passenger seat, Lilly slumbered. Precious, beautiful Lilly. A powerful sweep of warmth cascaded through Maria’s chest. Her six-month-old baby girl was tucked safe and tight into a car seat, further insulated by a snuggly soft blanket of pale green. Surrounding the innocent babe was every last possession Maria owned. The material items didn’t amount to much, yet they managed to fill the van in its entirety. Maria forced herself free of oppressive anxiety, reverting instead to survival mode. She began to coach herself. C’mon, Maria—don’t surrender, solve the problem. You have to keep moving. You need to make it to Mom and Dad’s new place in Huntington before Lilly wakes up wanting a lunch you can’t afford to buy. Expelling a breath, Maria drummed fingertips against the narrow circle of leather. Not far away she spied a sign. Lang’s Gas & Collision. At least the van was still running. She could probably gimp her way to the facility and see if there was anyone on duty who might be able to lend an assist. Angel Falls was picturesque, small-town personified; Lang’s seemed to be her only option. Fighting her steering wheel every bit of the way, inching into a turn that made her muscles scream, Maria made it to a gas pump and pulled to a stop. She sifted through the depths of her purse, grabbing her wallet. She already knew what she would find inside: a five dollar bill, a handful of change, and not much else. There were no credit cards that would be accepted and no checks she could write. Her bank account back in Fort Worth was closed. She clenched the simple cloth case, squeezing tight. Lilly would need formula soon, along with a serving of jarred baby food. Maria had nothing with her in the way of grocery items; she hadn’t planned on an automotive breakdown that would keep her from arriving at her parents’ new house before lunch. A five-spot and a few spare coins would have to see her through, and first things first, she needed to get some gas in the tank. Five bucks would get her just over a gallon of fuel. That allotment would get her to her folks’ house, but what would she do about repairs? Her car was far from drivable. A laden sigh rose from the depths of her body; her empty heart ached. For now, the only thing she could do was dash inside, find the attendant for some repair advice, and then call her folks to see if they could help with a repair loan. Plans in place, she left a slumbering Lilly secure in the car seat. After locking the car, she trotted toward the convenience area of the gas station, taking note of the three service bays attached to the store. Two of the available spots were filled, and one of the cars under repair was hoisted on a hydraulic lift, but no one seemed to be nearby. Not a good sign. She frowned and walked inside, weaving through a narrow food aisle, trying to ignore the instant gnaw of hunger that prickled through her belly. Who knew how long she’d be stranded, and she certainly needed an energy boost. Heaving a reluctant sigh, she grabbed a couple packets of crackers and cheese and silently kissed her last remaining funds goodbye. At the cashier’s space, an attendant tracked her approach, offering a warm, welcoming smile. He was about her age, sporting wavy brown hair. Judging by the uniform shirt and faded jeans he wore, he seemed to be the on-duty mechanic as well. While she drew near, he used an oil-spotted rag to mop his hands. Maria studied him for a moment. So, that’s why the service area was empty. Apparently, the mechanic who stood before her ran the shop as well. He was tall and lean, tan. The name Brody was stitched above the breast pocket of his Lang’s emblazoned shirt. “Can I help you, ma’am?” Smooth and silky, the cadence of his voice was soothing and appealingly musical.